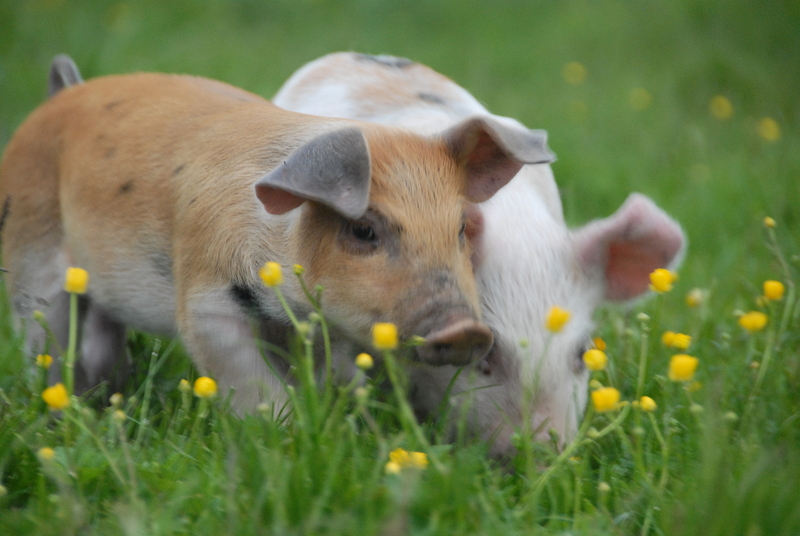 And here they are…meet the lovely Biscuit and Curly, our two weaner pigs. We are raising them for meat, in a ‘pig share’ with friends. We went to collect the piglets a couple of weeks ago. They came from latest batch of 700 weaners that had just been delivered to a near-by farm. Our two have settled in well, and it’s good to see them digging. wallowing, grazing and playing (they chase each other around like mad puppies). Liked it? Feel free to share! I’m hoping they get less so! They are absolutely adorable. Oh dear, how on earth are you going to eat them? I’m banking on them being ginormous, wiffy critters by then! That will help. Babies are by nature cute so they are nurtured to adulthood but then you have to let go…..
Nice pics ..they look like they are having fun! I like the idea of a pig share. Are the co-owners helping with the pig care or just the pig eating? We’re doing the day-to-day looking after (which is minimal – just topping up water, wallow and feed – tho we spend a lot of time hanging out just watching the pigs!) The co-owners are going to look after the pigs whenever we’re away. (They’ll also transport them to the abattoir when the time comes, as we don’t have a suitable trailer.) We’ll all join in the pig-eating at the end… tho being experienced stock-keepers, they picked a much larger piglet than we did, so they may have a lot more to eat! I hope they grow well and healthily. In case you find it too hard to eat them after naming and raising them, may I suggest arranging a swap with another smallholder? You eat their pig, they eat yours. Hi there – many thanks for the link, that’s very interesting. Yep they are both girls/gilts. 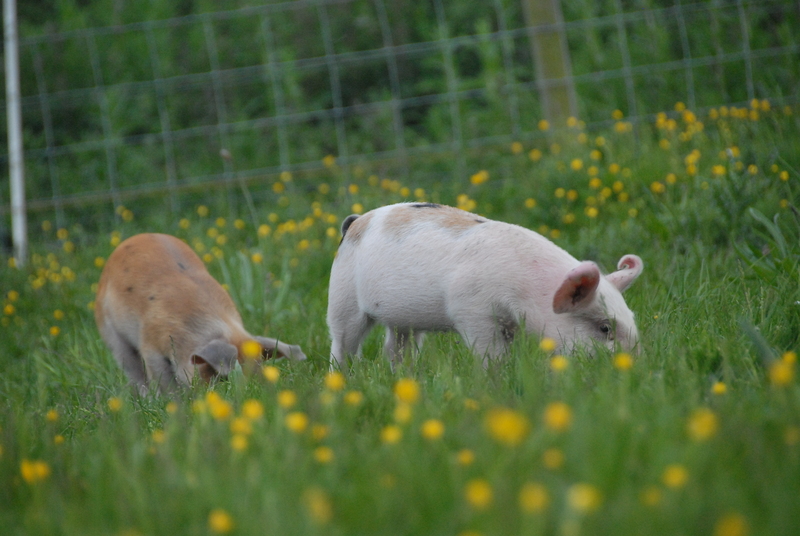 They do look Tamworth/Old Spot-ish, but they are just ‘commercial hybrid’ pigs, so a bit of a mix I think. Apparently some Duroc was used in these particular commercial hybrids, so that may explain Biscuit’s ginger colouring. Most of the piglets in their batch were ‘little pink pigs’ – but a few were ginger, or had dark spots, or other signs of their heritage. Another year it would be interesting to try rare breeds, but this year we just went for what we could find easily a few minutes drive away! Aww but they’re so cute! And have adorable names! And I guess will taste delicious? Glad you like the names, the various kids involved chose them! Hoping they will taste delicious…I’ll report back in the Autumn. Oh goodness they’re so cute, I fear it would turn me vegetarian. This isn’t going to help… but they are incredibly cute! And it looks like they’re going to have a really good life, doing all the things a pig should do.